Ramsey Lewis is a jazz pianist, composer and bandleader who has been highly successful and influential in popularising jazz through his crossover chart successes during the 1960s. This excellent-value 37-track 2-CD set focuses very much on his first recordings, when he was still in his early 20s, as leader of his highly-regarded trio which stayed together for the first decade of his recording career. 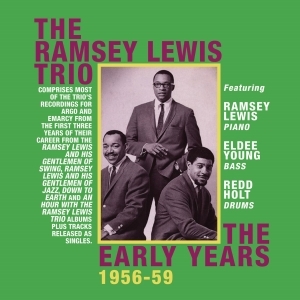 The trio consisted of Ramsey Lewis on piano, Eldee Young on bass and Redd Holt on drums, and this collection comprises most of the titles which they recorded during the first three years of their career together. Those titles were released on the LPs “Gentlemen of Swing”, “Gentlemen of Jazz”, “Down To Earth” and “An Hour With The Ramsey Lewis Trio” for the Argo and EmArcy labels, and on Argo singles. The repertoire represents a cross-section of interpretations of standards and original compositions which provide a fascinating insight into the development of the trio’s music during this key formative era, while also underlining the already highly distinctive style which would make them such an effective commercial vehicle just a few years later.